A deposit of $500 is required before Topbus will lock your event in. If for any reason you have to cancel your event, Topbus will refund the deposit, unless the event is less than one month away then Topbus will work with you to get another event at another time under way for you and use the $500 for the new event. The full amount for the hire less the deposit must be paid for 7 days before your event unless another date has been passed by Craig Nicholson Director. All liquor licensing laws must be adhered to and Topbus will enforce these rules. No BYO Topbus has a full on License and all alcohol will be sold in the bus. No intoxicated persons will be served, and the intoxicated persons will be sent home in a taxi at your expense. How many people can TOPBUS carry? We are licensed to carry 36 people. You can have any number of people you want under 36. For big events we can do multiple pick ups and drop offs too. 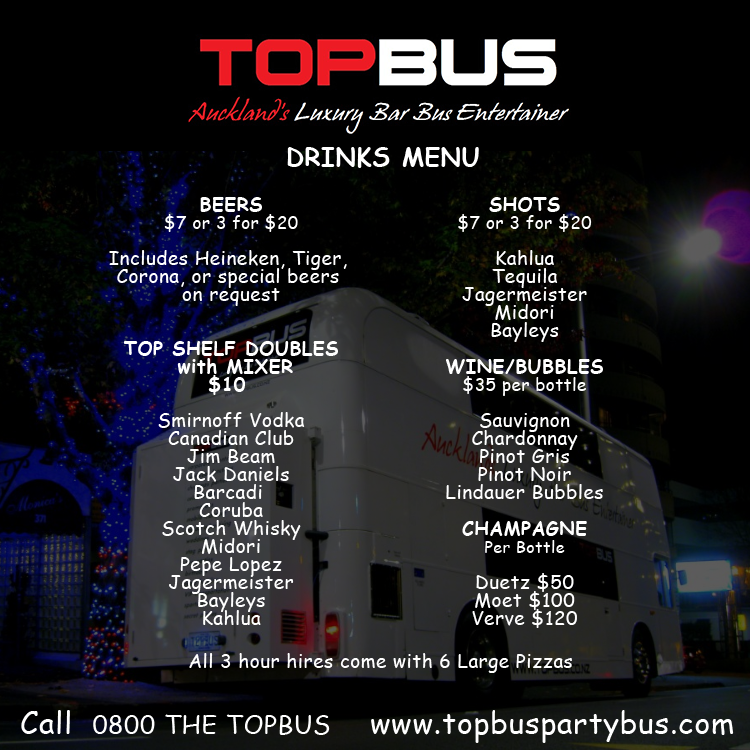 TOPBUS is a licensed venue, just like any bar, so the same rules apply, you must be 18 or over. The great thing is, we have TWO LEVELS so if PARENTS or LEGAL GUARDIANS want to come along they can relax in the downstairs lounge to give their teenagers upstairs some space. Of course if you’re 18 or over you are fine to travel without a parent or guardian, you are legal drinking age. Can we eat on TOPBUS? If you wish to use the Spa Pool you must book this and you will need at least 1.5 hours to stop and enjoy the pool, bring your togs and your own towels. Staff reserve the right to refuse entry to the bus and to refuse service at their discretion.